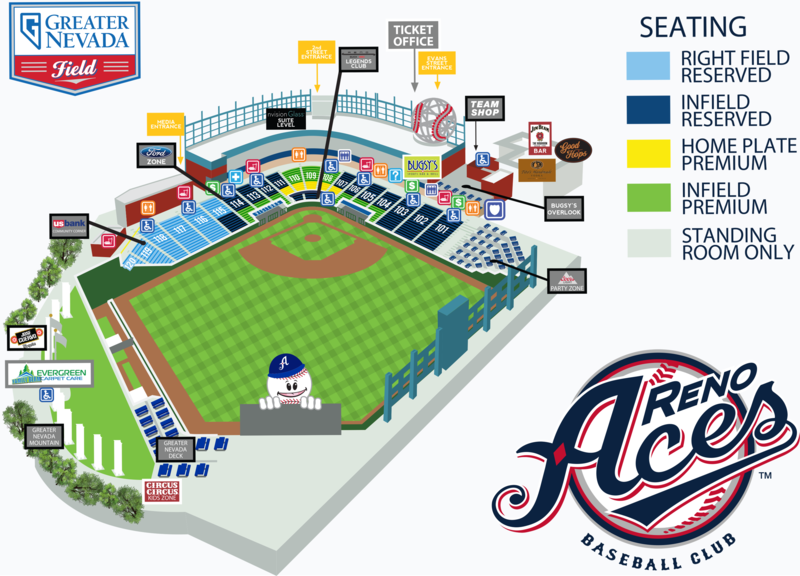 The Reno Aces would like to inform our guests of our security procedures and regulations. These policies are to ensure the safety and comfort of all our guests during our baseball games. Our staff is here to ensure a fun, family environment. 1. Bags, backpacks, and containers brought into Greater Nevada Field cannot be larger than 16" x 16" x 8". All bags, including backpacks and purses are subject to search prior to entry. No cans, weapons, glass containers, or alcohol may be brought in the Field. Hard-sided coolers are also not permitted. Strollers must be small enough to keep out of walkways and aisles, or be checked in the Guest Relations office located behind Section 105. 2. Banners and signs can be removed by management at any time. Each banner and sign must comply with our guest code of conduct. Signs and banners are permitted during the Aces games as long as they are baseball related, they do not obstruct the sight line of another guest, they are not in the field of play, they do not cover up any existing signage, they are not commercial or political in nature and in good taste, and they are not paraded around the Field. 3. Baseball bats are permitted with special restrictions. Management reserves the right to remove any bats from the ballpark at any time. Baseball bats are permitted for autographs before the game only. 15 minutes prior to game time, all baseball bats must be claim checked at the Guest Relations office behind Section 105. 4. For the safety of our guests, brooms, sticks, and poles are not permitted at the ballpark. On days that the Aces are going for a sweep, small whiskbrooms will be permitted. Brooms may not exceed three feet in height. No sticks or metal poles of any type are permitted at any time. 5. Chairs are also allowed into the Field for grass area seating, as long as they are low-back folding chairs. Guests with chairs are encouraged to sit towards the top of the Berm area. Only golf sized umbrellas are allowed. 6. Guests are allowed to bring sealed clear bottled water (20 oz), any type of flavored water is not allowed, into the Field. All other drinks are not permitted. Only individual servings of peanuts, sunflower seeds, and baby food are allowed into the Field. Guests with any other type of food or drink will be asked to return it to their vehicles or discard of it at the gate entrance. 7. Food and beverages (non-alcoholic) are allowed to go up from Greater Nevada Field into the Freight House District. Food is also allowed to come down from the Freight House into the Field, however, beverages from the Freight House are not allowed to come down into the Field. 8. Soap bubbles are not allowed to be created in the Field; bubbles machines of any kind are not permitted. Beach balls are also not permitted within the Field. Inflated beach balls will be confiscated and disposed of. No person shall intentionally throw, discharge, launch or spill any solid object (including baseballs) or otherwise cause such object to be thrown, discharged, launched, or to become airborne. For further information, please contact the Reno Aces Main Line at (775) 334-4700.